Before I tune out everyone on earth to watch Once Upon a Time at 8 PM, I thought I would let you know how great Muppets Most Wanted was! 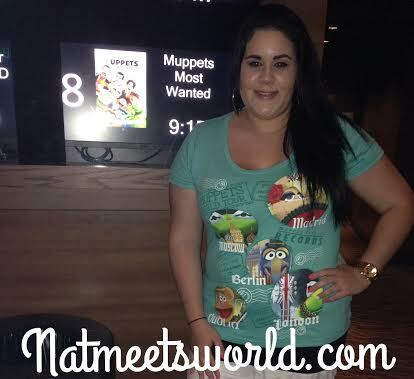 Last night, I threw on my new Muppets shirt, and headed over to iPic Theaters with my honey to check out the hilarious Muppets on the big screen. The Muppets Most Wanted is based on Kermit, Miss Piggy and their friends falling for an evil frog named Constantine, and his sidekick, Dominic Badguy (played by Ricky Gervais), persuasion to have the Muppets perform on stage all around Europe. The purpose of this is so that they can heist jewels! While touring Europe with their Muppets Musical, they become wrapped in a whirlwind of events that will bring laughter to all ages! I don’t want to tell you too much so I don’t ruin it for you, but the scenarios that the Muppets and actors are involved in are wickedly funny. I especially loved the inclusion of so many different stars including Lady Gaga, Usher, Chloe Grace-Moretz, Tony Bennett, P Diddy, Salma Hayek, and one of my favorites, Celine Dion! The Muppets are such a classic to the entertainment industry, therefore, this movie is worth going to the theater and not waiting for it to be released on DVD. I really enjoyed this film, and I hope you do too! Remember to keep your ticket stubs! You can earn points for this movie on Disney Movie Rewards.com. SImply write the unique code they give you after logging in, take a picture of your tickets and submit it for points towards some pretty cool prizes! My rating for this film is 4 out of 5 stars! Have you seen Muppets Most Wanted? Comment below and let me know what you think of it! Disclosure: All opinions and images are my own.